Home» Blog » Mr. Manjunath Bhandary meets Chairman of AICTE at the National Conference in Chennai. 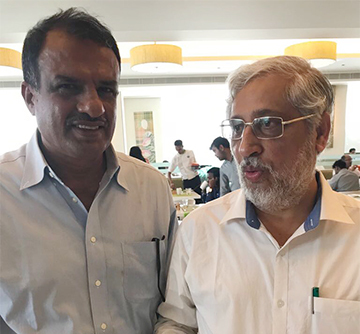 Mr. Manjunath Bhandary meets Chairman of AICTE at the National Conference in Chennai. Mr. Manjunath Bhandary, Chairman, Bhandary Foundation had the pleasure of meeting and interacting with Dr. Anil Sahasrabudhe, Chairman of All India Council for Technical Education (AICTE), at the National Conference on “Quality Assurance, Accreditation & Ranking of Engineering Institutions: Challenges & Opportunities” by the Education Promotion Society for India, held at Chennai. The conference witnessed active participation from Chairman, President, Director, Dean, Principal, and Professor of the various Institutions. Education Promotion Society for India (EPSI) formed by a group of senior educationists, educational entrepreneurs, intellectuals, industry leaders and policy makers EPSI has assumed a catalytic role in promoting the growth and quality of education in India. The society coordinates between Government and institutional operators, between academia and industry between the student community and beneficiary employers and between national and international bodies committed to the advancement of education. EPSI strives to facilitate complete literacy, globally competitive education, and generate skills and professionals for employment so as to foster socioeconomic development.